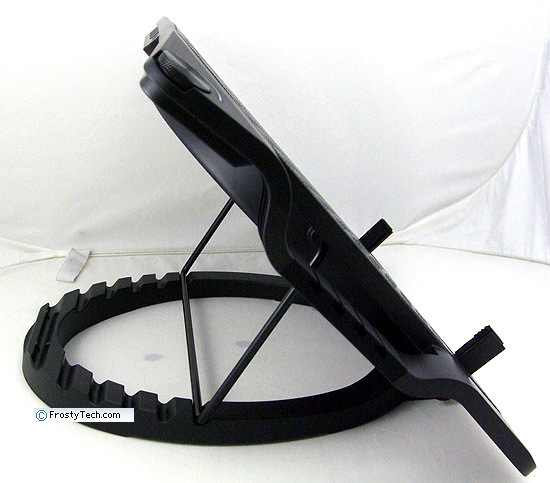 Abstract: Technically speaking, the Coolermaster Ergostand III supports laptops with footprints up to 15" wide and 11" deep at an angle of 3.5°or as high as 50° vertical. 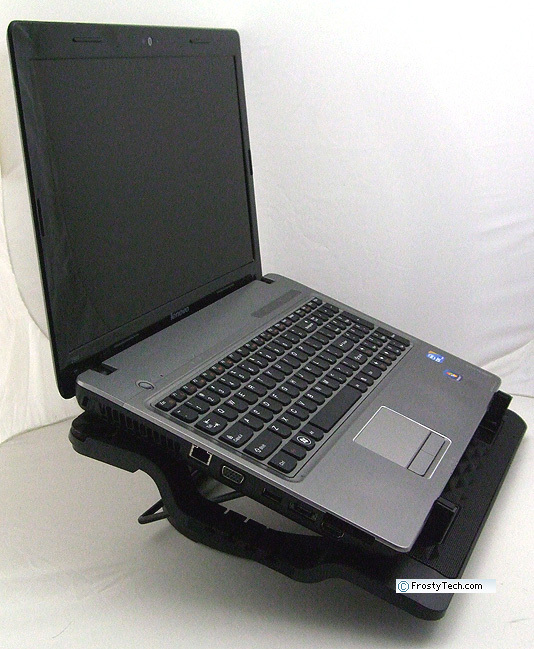 Besides cooling an overheating laptop, a notebook stand such as the Coolermaster Ergostand III can make working on a laptop more comfortable and less fatiguing. In the most basic sense, positioning the notebooks' keyboard to the user at an ergonomic angle helps reduce wrist strain, while raising the screen tends to be less fatiguing on the neck and eyes. Repetitive strain injury is one of those 'death by a thousand cuts' things that catches up with unaware users, so it's always worthwhile to find ways of eliminating it. 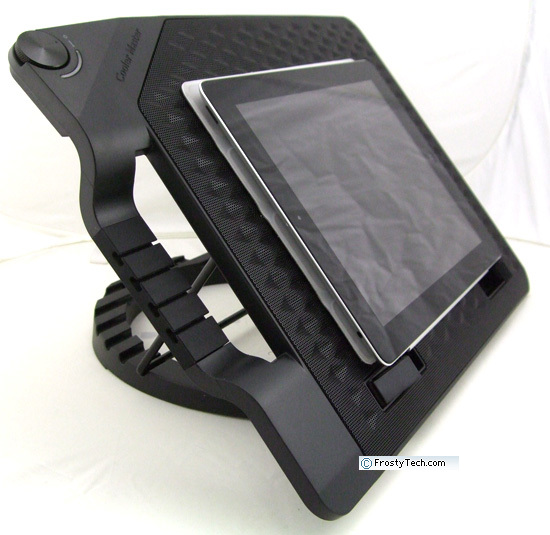 In some situations high end gaming notebooks will also greatly benefit from the stands' embedded cooling fan; lessening the need for the laptop's own internal fans to run as frequently, or as loudly, or at all... Coolermaster's Ergostand III laptop cooling stand does all this for laptops of course, it also support tablets just as perfectly. Made of plastic, with rubber moulded in where it contacts the notebook, the Coolermaster Ergostand III aims to address notebook/tablet cooling, cable management, comfortable viewing angles and USB port-multiplying in a decently stylish and portable package that weighs a little over 1.2kg. The Ergostand III has a design esthetic suitable for use in an office, which is a nice change from an industry far too preoccupied with satisfying the fantasies of teenagers. It's not built for use on a lap. 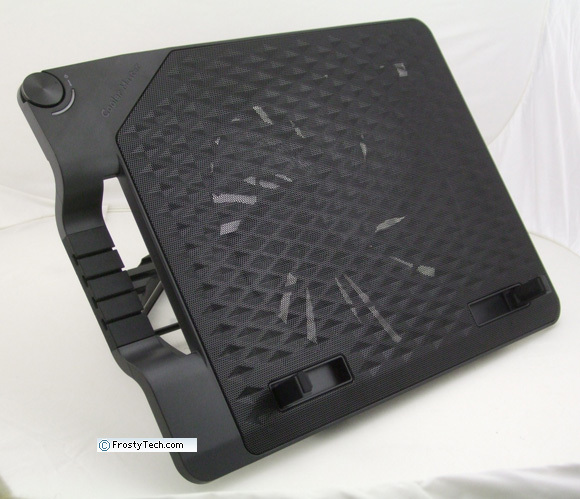 Technically speaking, the Coolermaster Ergostand III supports laptops with footprints up to 15" wide and 11" deep at an angle of 3.5°or as high as 50° vertical. At the rear of the unit is an integrated 4-port USB 2.0 hub which draws power from one of the notebooks' USB ports to power the hub and built in 215mm diameter cooling fan. The notebook stand has a metal mesh top so it's not always necessary to always run the fan, in many situations just having a little bit of airflow around the notebook base can be sufficient. When extra cooling is required, the large, quiet fan can be adjusted from 500-800RPM by virtue of the Ergostand III's dial fan speed control. Along the side of the Ergostand III, Coolermaster have added a small cable management block out of a moulded piece of rubber. Beyond that, Coolermaster also had the foresight to make the metal mesh the notebook rests on removeable so it can be cleaned and any dust bunnies blown out from the fan below. Coolermaster's Ergostand III retails for around $60 and supports laptops with screen sizes up to 17". The Ergostand III is made of plastic, with the notebook resting on a diamond patterned steel mesh that allows air to easily flow through the unit. 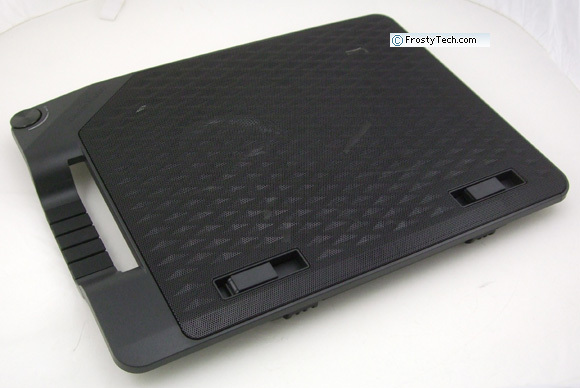 At first glance plastic may not seem as desirable a material for supporting a potentially expensive gaming notebook, but there's no chance of it scratching the notebook or tablet as with an aluminum notebook stand. Build-wise, the Ergostand III feels pretty solid. 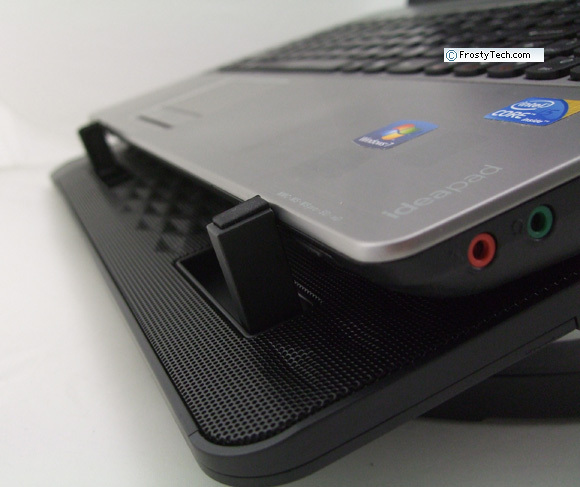 Depending on the angle the Ergostand III is set to, a positive stop will be needed to prevent the notebook (or tablet) from sliding completely off the stand. 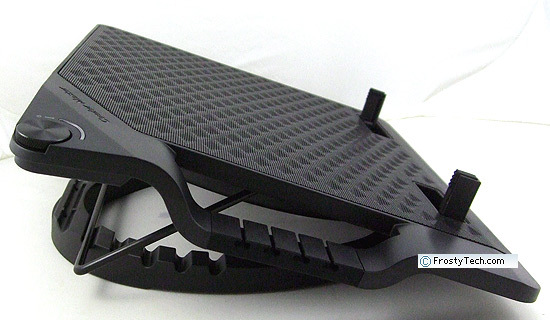 Two rubber padded stands are integrated into the lower edge of the Ergostand III. The rubber covered stops flip up about an inch, when not needed they can fold down completely flush to the surface and out of the way. 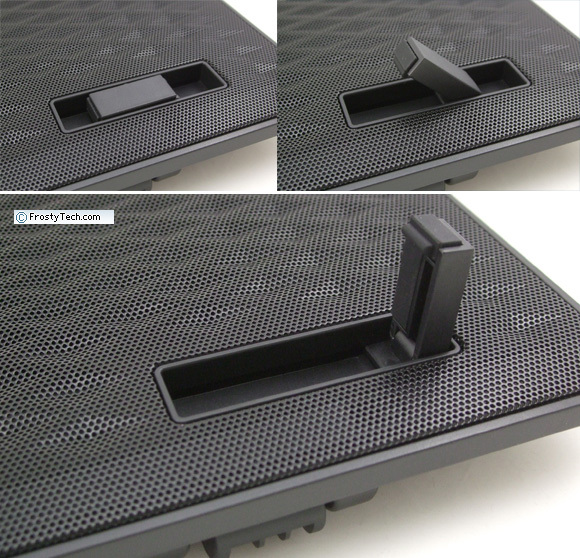 The stops can be opened fully or partially to accommodate thinner profile notebooks/tablets. For example, with a tablet you'd only need to raise the stops a few millimeters to prevent an iPad from sliding off. The Ergostand III has a built in metal height adjustment bar with pre-set stops that alter the angle of elevation from 3.5° to as high as 50° vertical. While it's very quick to change the angle by shifting the bar from one slot to the next, there's no positive locking tab or detent to keep the wire from falling out when the entire unit is raised - say if you're picking up the stand and notebook together to move to a different desk. When shifting the stand and notebook in this way, the lack of a detent can lead to the whole shebang collapsing. Live and learn. The Ergostand III has six different preset angles: 3.5°, 22.5°, 31.5°, 38.5°, 44.5° and 50°. Next up, a closer look at some of the features built into the Ergostand and where it falls short as a notebook cooling stand.